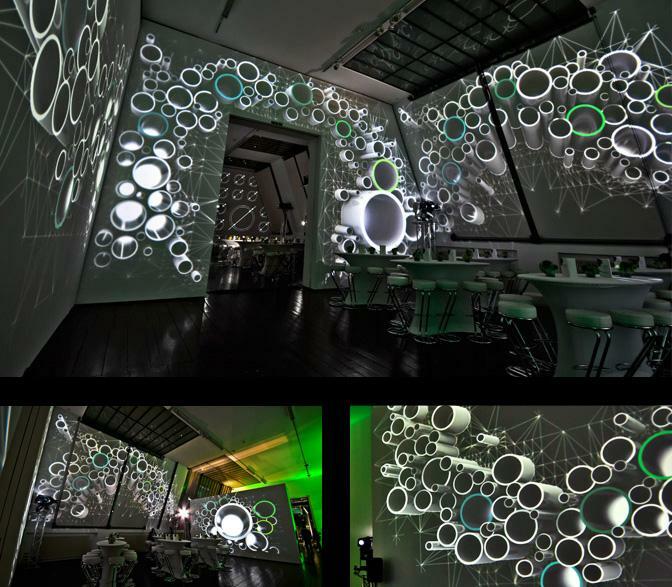 The new brand should be presented the very first time to company employees and company partners during this 2-day event and for this, MOTIONLAB was assigned to develop the projection design and visual drama. Whenever one must introduce a new brand, certain facts and framework requirements are given. The client has expectations, wishes and fears – just as we do. The goal is to put all of this information into a unique and extraordinary visual design. 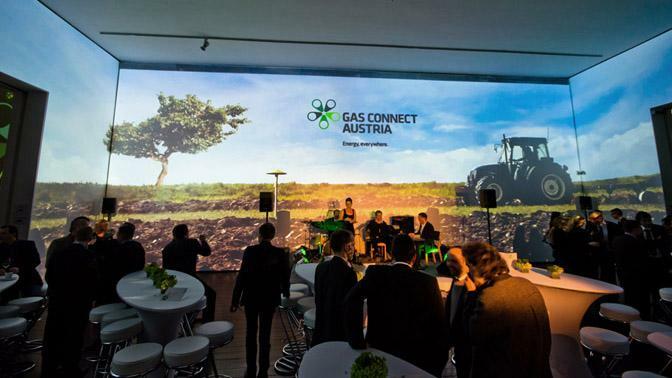 For GAS CONNECT AUSTRIA, it was necessary to find a balance between technology (core competence of the company) and emotion (the company values) and to generate an arc of suspense, reaching its peak at the logo uncovering for an impressive showdown. 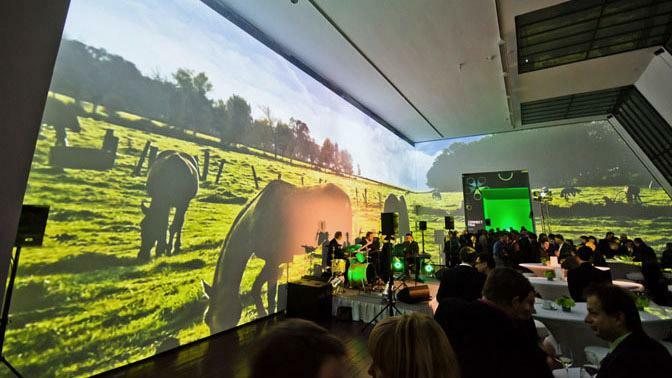 MOTIONLAB developed a content package including large-screen slide and panorama video projections where individual concepts match the architecture of the Augarten Contemporary. With regards to content the pipes are dominating the subject due to the core competence of the company – transportation of gas in pipelines. Also the new logo, created by WIEN NORD, refers to this pipeline context. 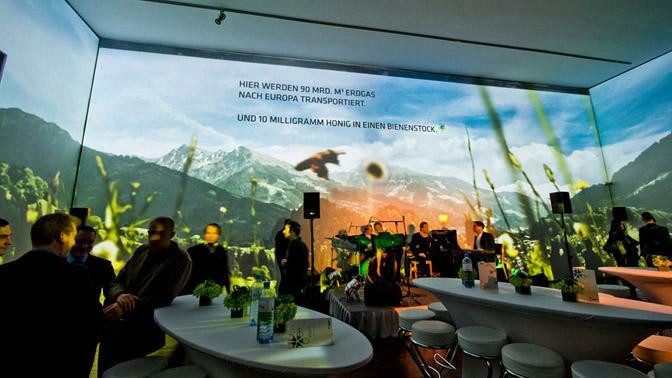 Under the topic “Explore the Rohr”, we welcomed guests to the location and gave them a new interpretation of their main “theme”. 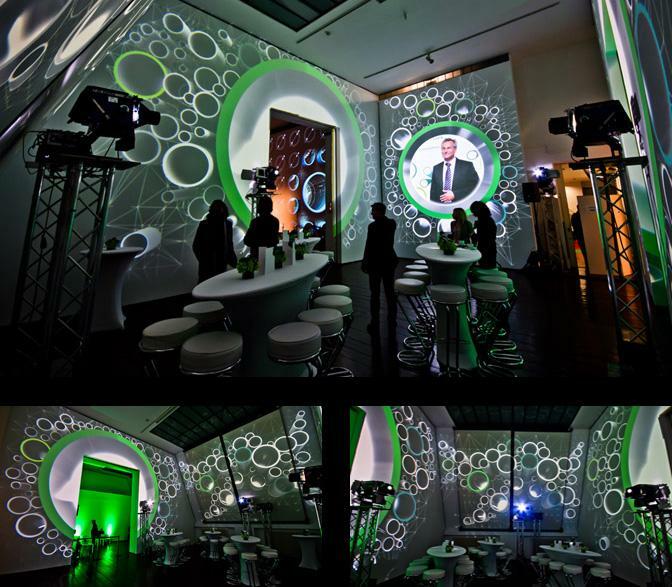 The highlight of the event was a 3-minute audio-visual-multi-screen clip named “The Birth of the Logo”. 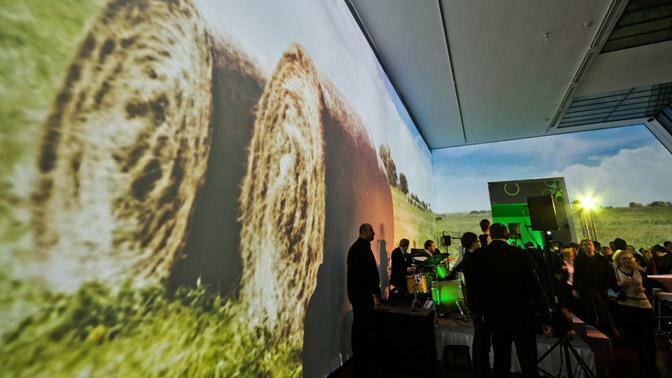 The 270 degree audio-visual experience teleported the audience into the new world of GAS CONNECT AUSTRIA. 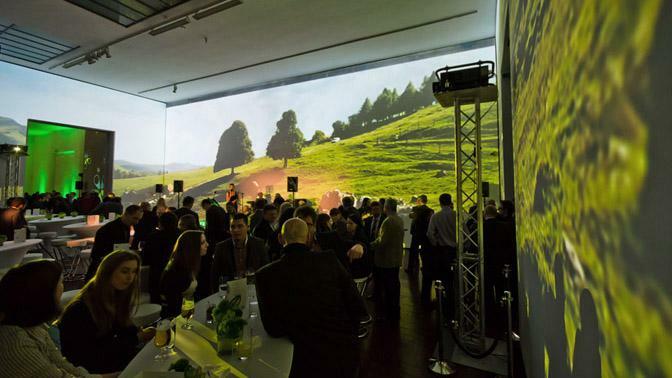 Previews of the Visual Content – huge analog and digital panorama projections on 3 floors – all-in-all over 500 square meters of projection design. 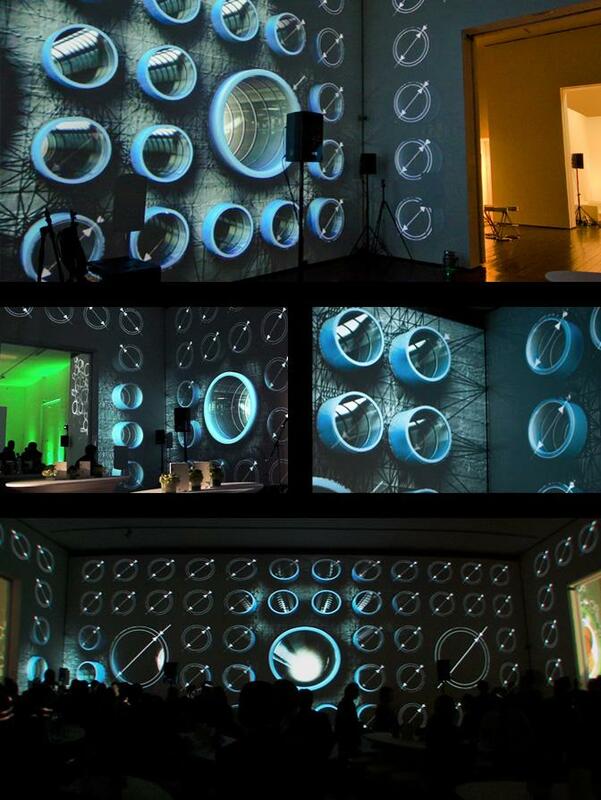 An overview of the 360-degree slide installation in the Foyer, set on stage with Pani high-power projectors. The pipes seem to come out of the walls – a nice optical illusion using mapping technology. On the other side of the mainroom, was Room3. These 2 rooms – Foyer and Room3 -”embrace” the mainroom, so we continued the pipe structure concept from the Foyer to Room3 and set this architectural embrace in the visual content on stage. (This concept goes further after the “uncovering” of the new logo.) The concept was extended by 2 more additions: First, more concentration on the main CI color and second, the idea that the further one (physically) moves in the location, the more tight, and compact the visual becomes. Following the concept of the Foyer, but with more focus on the main CI color and a tighter adjustment of the structure. During the employees event evening, an internal video was shown additionally on one the of the big pipes in Room3. The “Flashlight Clip” was the welcome content in the mainroom. Again it is dealing with pipes. 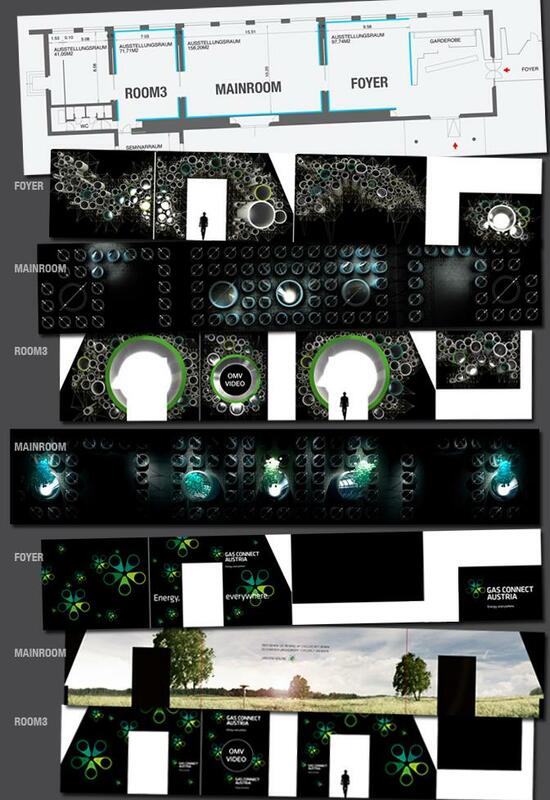 The basic elements are 2 image layers – a wire 2D-rendering and a high detail 3D-rendering of the same pipe structure with some lights which were moving around the walls. 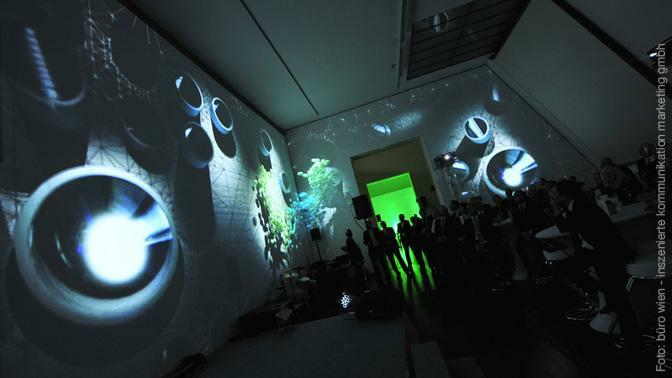 And everywhere the lights goes, the 3d-rendering of the wall structure became visible – similar to being in a dark room and shining a flashlight around. Very smooth and slow moving of the lights generates a calm but entertaining atmosphere, which aroused the audience’s curiosity. As one can see, the projection fits perfectly to the architecture and generates a nice 3D-illusion using mapping technology. A friendly welcome in an unique surrounding… Stefan Wagenhofer and Harald Stindl from the Management Board are talking about the new brand: the values, the vision and the expectations. Directly after the speeches from Management, MOTIONLAB’s “The Birth of the Logo” was shown. A 3-minute mapping video, built to take the audience on a journey to the new brand. On the picture above: gas particle systems are searching for a way to the top (“elevator scene”). The highlight of the show evening and the peak of the visual drama was a 3-minute audio-visual-multi-screen clip named “The Birth of the Logo”. It would be the very first time that employees would see their new brand – a unique (and tense) moment. Gas particles (in the new CI colors) come out of the pipes and begin searching for a way to the top. The pipe structure breaks up and the whole room feels like moving up (elevator effect). The audience follows the gas particles upwards into the pipeline network, a trip through a pipeline ending in a kind of tube-rocket-station. These tubes (part of the new blip) are shot up by the power of the gas particles in the sky and into the “typo universe” (new font). Out from this universe, the letters for the new brand name are selected and arranged slowly in the middle of the main screen . Finally, the letters and the tubes are shot out from this universe and are smashed on the wall. The new logo is born. The huge windows on location are opened and the illuminated garden could be seen from that point on. Above you can see a screenshot-timeline of the clip – started at the actual room situation, ending up in the new logo. After the uncovering of the new logo, the projections in the Foyer and Room3 turned on again, thus showing the logo and slogan in every room. The blip was arranged to a kind of smart wallpaper, slogan and brand completed the design. The roller blinds of the huge windows were opened, which enlarges the rooms and gives a feeling of freedom and comfort. Uncovering in the Foyer. Ladies and Gentlemen may we introduce… the new brand! The pipe structure disappears, the brand claims its space. Following the design concept from the Foyer: logo, slogan and brand dominate the room now.